Finding a parking space right next to your favourite café can seem like playing the lottery, but Park Tag wants to change all that. The startup, which is exhibiting at Disrupt NY’s Startup Alley, wants to make parking social so it’s easier to find your next space. 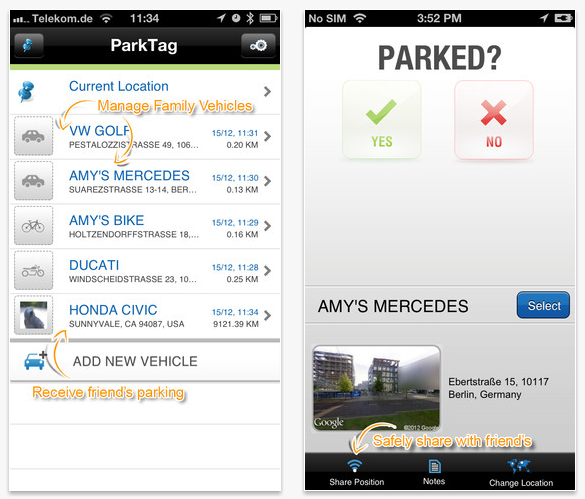 The Park Tag iOS app lets users invite their neighbours and colleagues to form a community of drivers who can help each other out by posting a parking space they are using before they’re going to vacate it so that another Park Tag user can book it. In return for posting and then successfully trading their parking spot, the user who posted it gets in-app credits to redeem on future parking spots when they’re in need of a slot. “Three hundred million people globally have a parking problem every day and we help them solve it,” founder Silvan Rath told TechCrunch. He said the social parking system can help drivers save time and money and even get to know their neighbours. CO2 emissions caused by people driving around looking for a parking place or leaving the engine idling when they wait for a space to be vacated is another problem the startup is hoping to address. Rath stressed there is no money changing hands — it’s a non-financial trade, with a little added encouragement oiling the wheels because the user who trades their spot gets credits from the person they traded with that will help them find parking in the future or to redeem as coupons. “The credits raises his ability to find parking spots next time and he can exchange these credits for coupons also for standard retailers out there,” said Rath. As well as a mobile app, Park Tag said they are also integrating with car manufacturers’ in-car dashboards linking to open APIs — building apps on top of platforms from the likes of Ford and BMW so users can post or book a parking spot from the dashboard. Park Tag also wants to integrate with peer-to-peer parking vendors like Park Me and Parking Vendors, said Rath, and is opening its own APIs for other co-branded applications who want to show parking availability. “We want to work with anybody out there. I think the user should have syndicated data. We should all exchange data. There should not be a proprietary parking app or something — people just want to have parking availability,” he added. The startup has soft launched its app in beta in January in three markets: Germany, the Netherlands and Turkey — where Rath said it has around 15,000 users. Here at Disrupt NY the startup has pushed the button on its global launch. “We just made it available on the global App Store. We’re launching on Android soon — and end of May we’re going to have the full feature set online,” Rath added.